LIVE UPDATE: See here to watch tonight for the potential scar of the impact. The Tusk focuses laser-like on impacts experienced by ancient humans. But when called for, I share items from current events that prove our thesis that the rate of cosmic collisions is far greater than generally acknowledged by science (and NASA). Yesterday the impossibly improbable happened once more on Jupiter: The 5th planet took the 5th slap in recent years as recorded by amateur astronomers Dan Peterson of Racine, Wisconsin and George Hall of Dallas. Hall’s video. June 28, 2010 NASA planetary protection chief: Impact estimates flawed! Below is Don Yeomans, the go-to-guy at NASA for impact threat analysis (for decades now), quoted in 2010 suggesting that it is “time we revise” our impact models. Well, Don? You have had two years — and I note no further comment and no revised impact models. Jupiter is getting hit more than we expected. Back in the days of Shoemaker-Levy 9 (SL-9), we calculated that we should see an impact on Jupiter once every hundred years or so. We considered ourselves extraordinarily lucky to witness the SL-9 event. But look where we are now. Anthony Wesley has observed two impacts within the past 12 months alone. It’s time to revise our impact models [particularly for small impactors]. — NASA’s Don Yeomans quoted June 10, 2010. These people no longer have any credibility with me. Fooled me once shame on you, fooled me twice shame on me — fooled me five times in a row sc#% you. The fact that Jupiter is seen hit a fifth time now in less than two decades — with four in the last three years — is prima facie evidence that there are more objects out there that threaten the gas giant and earth. Perhaps as alarming as NASA’s failure to adjust their statistics in the face of facts, is the science media’s failure to ask the hard questions of Yeomans, et. al. 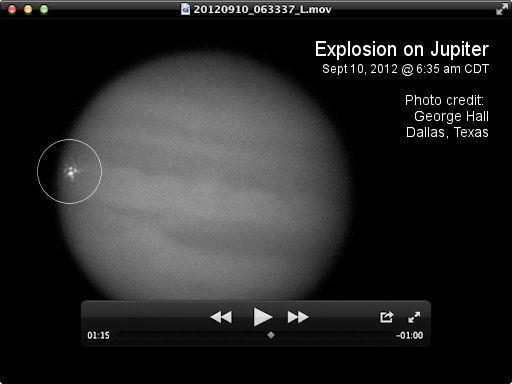 ; for instance, are their Jupiter impact “models” incorrect? And what is being done to rectify them? But as we have seen time and again regarding the underestimated risk of cosmic collisions — the subject consistently eludes the curiosity and professional responsibility of the Fourth Estate. There will be another silly round of, “Wow! Who’d a thunk?! ?.” But there will be no follow-through, no hard questions, and no surprise at the Tusk.